ZuoraZuora CEO Tien Tzuo filed an S-1 to take his ‘subscription economy’ startup public. 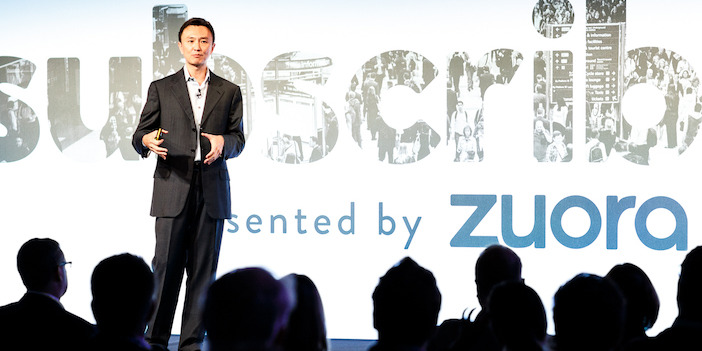 The $US738 million subscription startup Zuora filed to go public on Friday. Zuora, which sells software that helps other companies run their subscription businesses, saw $US168 million in revenue in 2018, but had a net loss of $US47 million. Though not very well known, Zuora runs the subscription services behind big-name customers like HBO, Ford and Symantec. The March madness continues as another tech startup has hopped in line for a 2018 initial public offering. Zuora, a Silicon Valley cloud software company, filed an S-1 on Friday afternoon. The company, which was last valued at $US738 million in 2015 according to Pitchbook, sells software that helps other startups launch subscription services. “The vision we started off with stays true to this day: We believe that one day, every company will be part of the Subscription Economy,” the company wrote in its prospectus for the offering. Zuora was founded in 2007 by its CEO Tien Tzuo – an early executive at Salesforce – and co-founders K.V. Rao and Cheng Zou, who both spent time at WebEx. The company itself runs on a subscription model, which accounted for nearly 72% of its $US168 million revenue in fiscal 2018, which ended January 31. The rest of its revenue came from professional services like training and deployment services. Revenue grew by 48.6% from 2017 to 2018, which was up from 22.6% annual growth from 2016 to 2017. But like many of the companies going public this year – including Dropbox and Spotify -Zuora is still in the red. In 2018, the company lost $US47 million. The company has an accumulated deficit of $US258.7 million. Zuora now claims 971 customers with a span across media, tech, transportation and other industries. Some of its big-name customers include HBO, Box, Symantec, GitHub, Ford and Delta Airlines.